Ooooh, something to shoot for. ETA: I won't start until Phil's done, I hate goals in general, and moving ones in particular. I clearly type far faster than I think. i can't agree. 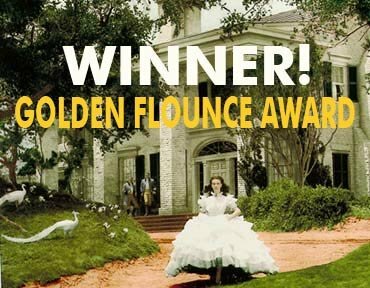 A really award-winning flounce is sort of awe-inspiring and possessed of a certain kind of dramatic flair and elegance. Phil's just has me drumming my fingers on the desk. Waiting. And waiting. Although I would like to see him in that dress. Ooooh, something to shoot for. I like a li'l competition. OK, I'll start keeping the book. Let's say 7-3 odds Maddy takes over 12 months to leave the forums. Who wants in? Damn you. Now my ears are ringing. Maddy's been flouncing since the day she first posted. Pffft. Maddy isn't gonna flounce. 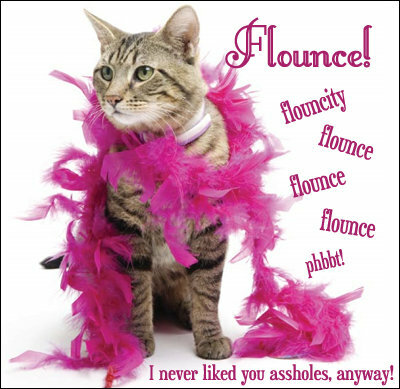 She might leave but she isn't a flouncer. Well. Ok. If she sets SL and the forums on fire and then leaves, she flounced. I knew I had a pic of Maddy somewhere. Why, oh why is everybody ganging up on meeeeeeeeee?! You love every minute of it. Internet usage is that a flounce is a drama-laden exit. Leaving on a certain date for a stated reason isn't a flounce. Talking about it repeatedly is. Regardless of who starts it, you have been doing that. In making your announcement very early and very publicly, you've given those who know how to bait you yet more ammunition. It's hardly a surprise that they use it, or that you take the bait. This guarantees the addition of drama to the months before your departure. I'm not going to get into another back and forth with you. This is how some of us see it. I made a light-hearted joke and it got some traction because there's a ring of truth in it. It feels like a long, drawn-out flounce. I will miss arguing with Phil, “poking the bear” so to speak. ETA: I won't start unt﻿il Phil's done, I hate goals in general, and moving ones in particular. I suspect something like, “I will leave the day after the forum shuts down”. Someone mentioned thread nuking, and it summoned me from under my rock. Locked thread due to a long back and forth that wasn't really germane to the discussion. *In California, "dudes" refers to a collective plural of all genders inside and outside of the spectrum, including non-gendered inanimate objects. See also: "y'all," "folks," and "peeps." May also be used in place of "all mankind," though not as a substitute for the wrestler Mankind, even though one could probably make the argument that he has some resemblance to the character of The Dude. Not, like, a lot, but it's an argument that hypothetically could be made. That's more of a coincidence, though. Anyway, "dudes" applying to everyone and everything that is plural is what I'm getting at here. Cool?